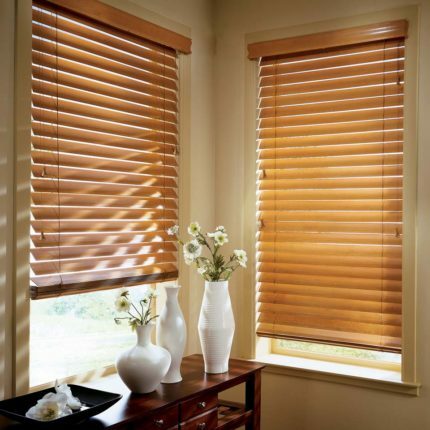 We carry genuine hardwoods, faux wood, aluminum, and vinyl blinds. We also offer ones made from sheer fabrics, woven fabrics or room-darkening fabrics. 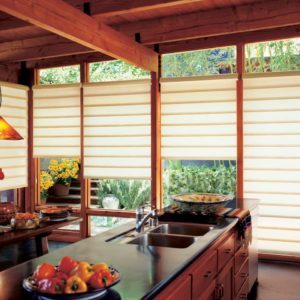 Hunter Douglas blinds set the gold standard of quality — offering maximum view-through when opened, and optimal privacy when closed. 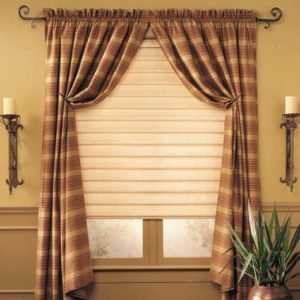 With a wealth of options available, there is bound to be a window treatment that will look beautiful in your home. Hunter Douglas horizontal blinds are ideal for windows that are taller than wide. Select from premium hardwoods, durable polymers or versatile aluminum. Hunter Douglas vertical blinds are suited for windows that are wider than tall and slide from side to side. Find ones made from sheer, woven and room darkening fabrics, as well as from vinyl, faux wood, genuine wood and aluminum. There are also Skyline® Gliding Window Panels, which have a sleek contemporary look and offer the perfect sliding window panel solution for window expanses. Parkland® Classics™ with rich colors … bright, modern stains … Parkland™ Classics™ wood blinds offer our widest selection of paint colors, stains and slat sizes, so you can find just the right design for your home. EverWood® TruGrain® is our most comprehensive collection of alternative wood blinds in realistic grain patterns built to withstand heat and humidity. Choose from popular stains, and flat and beveled options. EverWood® Distinctions™, featuring a best-selling color selection of whites and creams, Everwood® Distinctions™ alternative wood blinds can bring a bright, classic look to any room in which heat and humidity abound. EverWood® Renditions™ – Looking for value in alternative wood blinds? 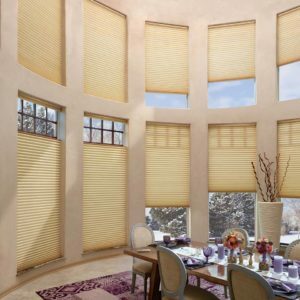 Everwood® Renditions™ is an economical blind collection offering white finishes and wood-grain colors, all ideal for rooms with heat and humidity. Reveal® – When the view is your focal point, opt for Reveal® with MagnaView® aluminum blinds. Designed to allow slats to nest together, they provide twice the view-through as standard 2″-slat blinds. Macro – A dramatic look for large windows, our 2″ Macro blinds offer a wide view-through. A standard de-Light™ feature hides cord holes and blocks light for better light control. 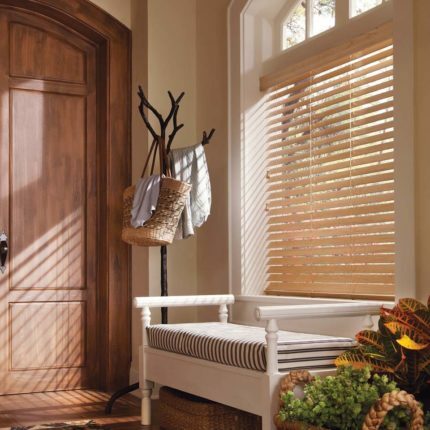 Natural Elements® – Our Natural Elements® blinds are a unique combination of aluminum slats and real wood valances, bottom rails, tassels and tilt wands. MagnaView® is optional. de-Light™ is standard. Lightlines® – Our ½” and 1″ Lightlines® aluminum blinds come in the widest range of colors and finishes, and offer maximum light control and privacy. de-Light™ is standard. Décor® – ½” and 1″ Décor® blinds are our most traditional aluminum blinds and feature standard cord holes and a contoured designer headrail for a sleek, fashionable look. Celebrity® – Our 1″ Celebrity® blinds are an economical assortment of aluminum blinds offered in a wide selection of colors. A beveled headrail is standard for that clean, traditional look. 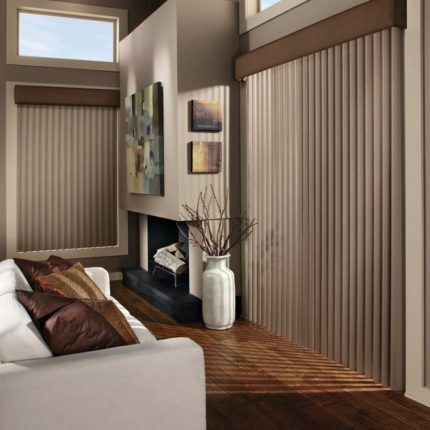 Skyline® – Skyline® Gliding Window Panels are a patented twist on vertical blinds. A sleek, contemporary design lends drama to any décor, whether covering large windows or when used as a unique room divider. Cadence® – Our Cadence® Soft Vertical Blinds feature patented curved vanes, mimicking soft drapery folds that move smoothly and quietly along their track; ideal for elegant styling and translucency. Somner® – Our Somner® Custom Vertical Blinds offer the largest selection of colors, treatments, and textures. Materials include fabric, vinyl, and aluminum. 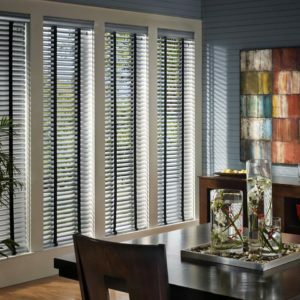 Vertical Solutions® – Our Vertical Solutions® Vertical Blinds are an economical assortment of verticals offered in 3 ½” or S-shaped vanes in dozens of modern styles, patterns and colors. Available in fabric and vinyl. Crosswinds® – Our Crosswinds® Wood Vertical Blinds are specially treated genuine hardwood that adds warmth and richness to any room. Finger-jointed construction adds strength and durability. Somner® – Our Somner® Custom Vertical Blinds offer the largest selection of colors, treatments, and textures, from wood grains and smooth metal finishes to geometric patterns. Materials include vinyl, aluminum, and fabric. 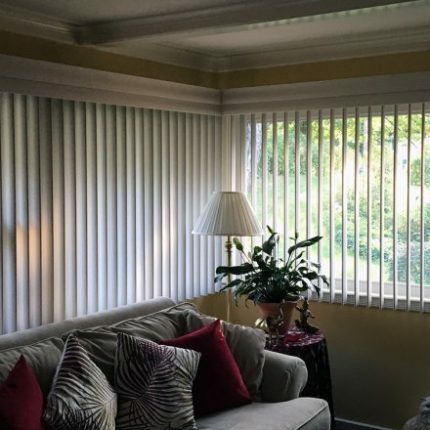 Vertical Solutions® -Our Vertical Solutions® Vertical Blinds are an economical assortment of verticals offered in 3 ½” or S-shaped vanes in dozens of modern styles, patterns and colors. Available in vinyl and fabric.